If I had to pick a favorite wild berry, the black raspberry would probably be the winner. Also known as blackcaps or Rubis occidentalis, they grow wild throughout much of the eastern and midwestern United States, but can be cultivated anywhere in USDA zones 4 through 8. If you have a some near you, brave the brambles and try a few. Go for the dark ones that easily slip off the vine. The blacker they are, the sweeter the taste. 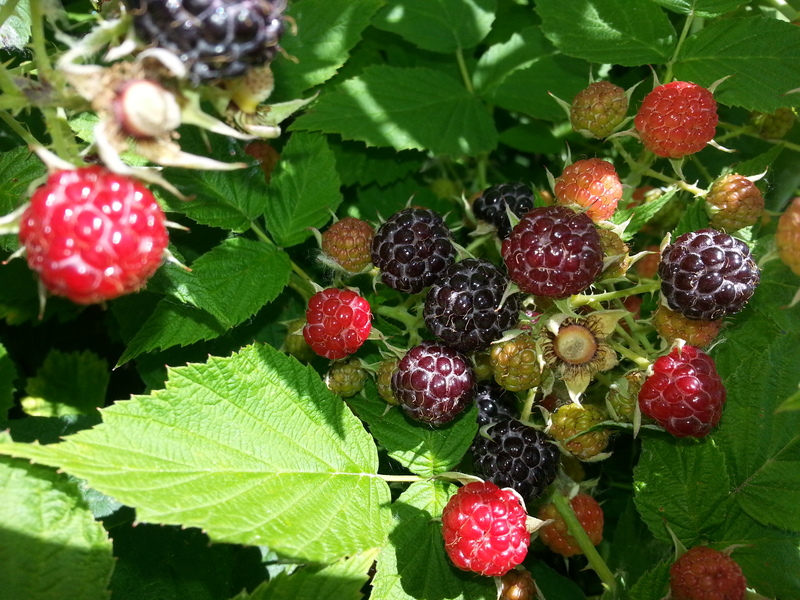 I know it’s really summer when the black raspberries ripen, which they’ve just begun to do in the past few days. What do they taste like, you ask? I could say that they taste something like red raspberries, but with more zing and sweetness, but that doesn’t really explain it. Black caps are to red raspberries what a Tesla is to a Yugo, or a field of flowers to a box of Crayolas named after those flowers. They are a taste of heaven. When my dad was a little boy, his mother would send him out with the other youngest child to pick blackcaps for pies. He and his sister both thought this was a silly chore. Why pick blackcaps for pie when you can eat them straight off the vine? They taste so much better that way. Their mother, however, did not like them to return with purple faces. Apparently she had not heard the universal rule of berry picking, which teaches that the picker gets to pop at least one in the pie hole for each berry that goes in the bucket for the pie. The first two are easily dealt with if you wear long jeans, a long-sleeved shirt and hat. Mosquitos are more common in blackcap patches that are on the edges of woods (mosquitos love the shade), so if you find a patch a patch out of the woods you’re better off. If that’s not possible, aim for a time of day when the sun hits the black cap patch directly. There’s not much to do about the third one if you’re picking in an urban setting. People will see what you’re doing. They’ll stop and ask if what you’re picking is edible. Unable to contain your enthusiasm, you will say, “They are the best fruit on earth!” They will taste a blackcap and agree. Pretty soon, the entire neighborhood will be at the patch. Kids will eat them by the handful, exclaiming that they’re better than candy. They’ll come back day after day, plucking the newly ripe fruit before you get out of bed. Your trusty blackcap patch is no longer yours. Ah, well. You have spread joy through the world. And worry not. There are more blackcaps out there for you to find. Once you do, wear mosquito netting or a hazmat suit as you harvest. No one will be tempted to join in your fun then. There are many things you can do with your harvest when you return home. My favorite is to eat them plain. I also freeze some on cookie sheets to enjoy later in ice cream, yogurt or hot cereal. Lots of people like to bake with them, but I think that tends to dilute their flavor. 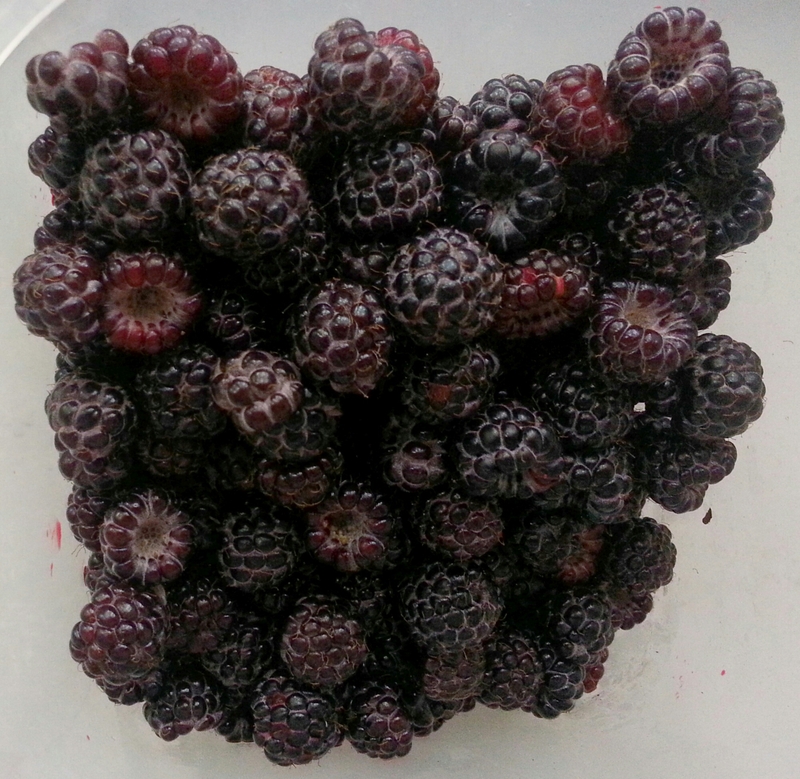 Before I had a freezer, I would mix the excess 1:1 with mulberries, add a little sugar, and can them. This made a delicious stir-in for plain yogurt. The mulberries helped stretch the blackcaps, as well as reduce the seediness of the final product (blackcap jams and sauces can get pretty seedy). If I had a real glut, I would indulge myself by making blackcap juice in my Finnish steam juicer (there’s a cheaper version here, but I haven’t tried it). The resulting product was a true nectar of the gods. The solids still had a lot of flavor after the juice was extracted, so I’d use that as a base for black raspberry wine — truly the finest wine that humankind has ever tasted. If I were an entrepreneur, I suppose I would have touted the juice and booze for their antioxidants and sold them, perhaps giving Pom Wonderful a run for their money. Instead, I kept them to myself and doled them out for special occasions or gave them as gifts to friends. This approach, I think, has made me richer than the business one. Put the raspberries in the steamer insert and steam for 1 hour until the raspberries have collapsed. * Sweeten to taste by adding the sugar or xylitol directly to the juice after it has collected in the reservoir. Makes about a gallon of juice concentrate. I like this diluted 1:1 with ice or water. Put the raspberries in a pot with one or two cups water. Simmer, stirring often, until blackcaps are collapsed and mushy. Line a colander with coffee filters, cheesecloth, or a clean white tea towel that will never be white again. Place the colander over a large pot. There needs to be enough room below the colander to catch all the juice from your berries (up to a gallon). Ladle the cooked raspberries and juice into the lined colander, set in fridge and let drain overnight. Drain hot juice into sterilized bottles or jars and process in a boiling water bath for five minutes, or drain into hot unsterilized bottles or jars and process in a boiling water bath for 10 minutes. *Save the collapsed/strained berries for making blackcap wine or vinegar. I’ll be posting recipes for both soon.